Long Division, or, Happy 5774! Rosh haShanah, the Jewish New Year, ended tonight with the beginning of Shabbat. Although there are many meanings behind Rosh haShanah, the one most often cited is that of the commemoration of the creation of the universe. From the get-go, from Genesis 1, we see that God created by dividing. Dark from light, night from day, eventually woman from man, the unraveling of Biblical creation was a series of separations. The ability of God to create through division that is pictured in Genesis is quite different from the human attempts at mimicry, and quite different from the spectrum of light and dark, night and day, male and female, that we actually see in our world. In Judaism today, the mehitza is one of the most central and controversial forms of separation. The mehitza is a clear symbol of separation in traditional Judaism. Reform Judaism did away with it long ago, as did Conservative Judaism, but even the most progressive of Orthodox synagogues will still have one. 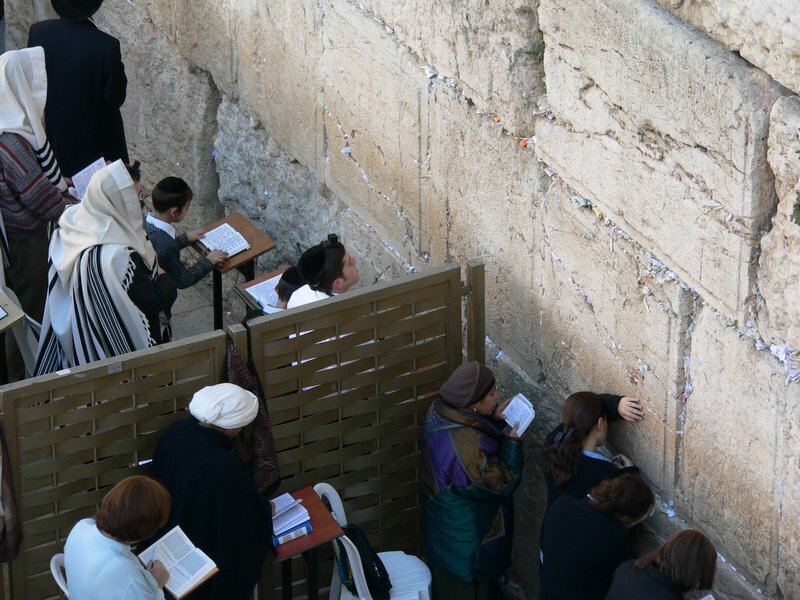 Gender separation has been a big talking point in Jerusalem lately as the Women of the Wall have gained critical mass. One of my colleagues and friends here has pointed out something very interesting about the Women of the Wall movement. They aren’t asking for desegregation. They are asking for separate but equal status. Separate but equal comes with some serious social baggage in the American parlance, but in this situation it is a different concept. When we look at the mehitza, or the concept of gender separation as a symbolic, ritual method of signifying holiness, Western Liberal bias against segregation of any kind runs into a non-rational roadblock. In fact, this is a prominent locus of the inner conflict of progressive Judaism. Attempting to adapt a tradition so defined by its use of separation and division to the Enlightenment values of equality and universalism is a real challenge, and one we haven’t really dealt with head on. Instead, we attempt to circumvent the challenge by focusing on other aspects of the tradition, while eschewing the traditions most clearly representing this separation of categories, such as keeping kosher, wearing symbols that separate us as Jews from the rest of humanity, and the abstentions of Shabbat that would keep us from participating in non-Jewish society. The issue of division, and clear, contrasted separate parts, is one that has arisen throughout my experience so far in Jerusalem. What is my Judaism and that of the school I am attending? Or of those whom I am attending school with? Or of the city I am residing in? Is the identity that I have formed throughout my life ending, and a new identity of future rabbi beginning? Due to the centrality of these questions in the future that I am hurtling towards this Rosh haShanah has taken on much greater significance than it has in the past. This evening in Jerusalem I went to an egalitarian Orthodox community for Shabbat, one which is quite interestingly very popular amongst my classmates. I’ve been a few times before and every time the mehitza has been a distraction for me. Not only is it alien for me to be praying amongst only men, but the nature of something being hidden purposely from me, even if it is only by a translucent cloth barrier, calls my attention to it. Simultaneously, the effect of the separated singing, with voices eventually blending in the shared air, has a distinctily different effect than both genders singing together. I’m no expert at acoustics, but the different tones divided by location caused the eventual mixture to be not only more discordant, but jarring. Although this may not have been the intention there is also a sense of competition between the two sides. Inevitably, and usually only momentarily, the two sides would reach a balance and meet perfectly. The outcome is beautiful and brilliant. This is the nature of the conflict between unity and division. The contrast of disunity with unity only highlights the beauty of the eventual combination. A perfect medium is a beautiful thing, but at what cost do we divide in the first place? The nature of our material reality makes it impossible for us to divide cleanly. Our lives are made up of a spectrum of grays, not the divisions attempted by those who would have things be pure and impure, kosher and unkosher, holy and unholy. But we must divide. To remember our lives, we divide our experiences by dates, times, as relative to one another, as formative or not. The most sacred moments in our Jewish lives mark divisions: being named at 8 days as a division from nascent being to full humanity, becoming bar or bat mitzvah as a division between irresponsibility and full responsibility, marriage as a commitment to blurring the division between yourself and another while dividing the new pair from the rest of the community, and the rituals of death, the most clear divider of all. These lifecycle events are things often outside of our control. At a certain point a baby must be considered human. Around puberty it is fair to start making a young adult responsible for themselves. Although marriage is not for everyone, for those who find meaning in it marriage is something beyond rationality – a desire to form a link to another person so beloved that you feel you must continue forward as one. And you know how the saying goes: death and taxes. The perception of these things being out of our control make them much easier to swallow. Another commandment that is at first glance beyond rationality is that of the blowing of the shofar on Rosh haShanah, an act of marking the division of the inevitable new year. Another of my friends and colleagues at rabbinical school recently pointed out that the Hebrew root for the word “shofar” (שפר) tends to be related to the goodness of something, or to the action of making something better (לשפר). Alongside this, breaking the word up into a prefix along with a word can also mean that which divides ([ש-פר[ר). If we combine these multiple meanings of the word shofar, and look at them in light of the creation of the universe in Genesis which is also being celebrated on Rosh haShanah, our tradition gives us an excellent guideline for how best to create through division.